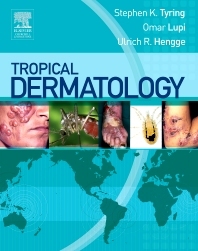 A practical approach to the diagnosis and treatment of tropical skin diseases! Readers will find concise discussions of epidemiology, diagnosis, differential diagnosis, pathology, laboratory tests, management, and prevention for both common and rare conditions. And, over 800 color photographs and diagrams deliver excellent visual guidance. Examines the full range of tropical skin diseases, both common and rare, as well as issues for travelers, important considerations for people working in the tropics, and non-infectious conditions. Makes guidance easy to find and apply with consistently organized, templated chapters. Illustrates the appearance of disease with color artwork and hundreds of color photographs. Structures clinical guidance by disease rather than by microbe or "bug". Integrates the knowledge and experience of internationally recognized experts in dermatology from the United States, Europe, South America, Africa, and Asia.